The Arabidopsis thaliana LEC2 gene encodes a B3 domain transcription factor, which plays critical roles during both zygotic and somatic embryogenesis. LEC2 exerts significant impacts on determining embryogenic potential and various metabolic processes through a complicated genetic regulatory network. An ortholog of the Arabidopsis Leafy Cotyledon 2 gene (AtLEC2) was characterized in Theobroma cacao (TcLEC2). TcLEC2 encodes a B3 domain transcription factor preferentially expressed during early and late zygotic embryo development. The expression of TcLEC2 was higher in dedifferentiated cells competent for somatic embryogenesis (embryogenic calli), compared to non-embryogenic calli. Transient overexpression of TcLEC2 in immature zygotic embryos resulted in changes in gene expression profiles and fatty acid composition. Ectopic expression of TcLEC2 in cacao leaves changed the expression levels of several seed related genes. The overexpression of TcLEC2 in cacao explants greatly increased the frequency of regeneration of stably transformed somatic embryos. TcLEC2 overexpressing cotyledon explants exhibited a very high level of embryogenic competency and when cultured on hormone free medium, exhibited an iterative embryogenic chain-reaction. Our study revealed essential roles of TcLEC2 during both zygotic and somatic embryo development. Collectively, our evidence supports the conclusion that TcLEC2 is a functional ortholog of AtLEC2 and that it is involved in similar genetic regulatory networks during cacao somatic embryogenesis. To our knowledge, this is the first detailed report of the functional analysis of a LEC2 ortholog in a species other then Arabidopsis. TcLEC2 could potentially be used as a biomarker for the improvement of the SE process and screen for elite varieties in cacao germplasm. The tropical tree Theobroma cacao L. is cultivated as a cash crop in many developing countries and provides the main ingredients for chocolate production. In 2011, the global market value of the chocolate industry surpassed $100 billion and the demand for cacao beans (seeds) continues to increase . Cacao trees are generally highly heterozygous and when propagated by seed, only a small fraction of individuals are high producing [2–4]. Thus, vegetative propagation systems provide a means to avoid the issue of trait variation, through cloning of the top elite individual genotypes. Several methods of vegetative propagation are commonly used with cocoa (grafting and rooted cuttings techniques). In addition, in vitro somatic embryogenesis (SE) tissue culture offers an approach to speed up the development and deployment of genetically improved genotypes because of its potentially very high multiplication rate and scalability. Protocols for primary and secondary SE in cacao have been well documented [5–8]. However, SE can be limited by embryogenic efficiency, which varies significantly between genotypes. A deeper understanding of the genes and mechanisms involved in regulating the SE process in cacao could potentially lead to improvement of SE methods for commercial plant production. To characterize the mechanisms regulating embryogenesis, we have chosen a translational biology approach, leveraging the knowledge gained from the model plant Arabidopsis. In Arabidopsis, leafy cotyledon (LEC) transcription factors, including AtLEC1 , AtLEC2  and AtFUS3  have been characterized as master regulators of zygotic embryo development . The AtLEC2 gene encodes a B3 domain transcription factor, which binds specifically to the RY motifs in the 5′ flanking regions of AtLEC2-induced genes . AtLEC2 is exclusively expressed in developing zygotic embryos during both the early development and maturation phases. It is required for development and maintenance of suspensors and cotyledons and for the acquisition of desiccation tolerance and inhibition of premature germination . Loss-of-function Arabidopsis lec2 mutants exhibit pleiotropic effects including abnormal suspensor anatomy, abnormal cotyledons with trichomes, precociously activated shoot apical meristems, highly pigmented cotyledon tips with prominent anthocyanin accumulation and reduced accumulation of seed storage compounds [10, 14, 15]. AtLEC2 functions both by inducing a cascade effect of other transcription factors controlling various developmental and metabolic pathways as well as through direct targeting and regulation of seed storage genes [16, 17]. For example, AtWRI1, another key transcription factor crucial to embryo development, is a direct target of AtLEC2 and is necessary to regulate normal fatty acid biosynthesis . LEC genes are also important during somatic embryogenesis. For example, lec2 mutants produced SEs in Arabidopsis at a very low efficiency , while ectopic expression of AtLEC2 in Arabidopsis and tobacco vegetative tissue induced SE formations [10, 19, 20]. In addition, the capacity for SE was abolished in double (lec1 lec2, lec1 fus3, lec2 fus3) or triple (fus3 lec1 lec2) LEC mutants, which further confirms the critical and redundant roles of LEC proteins during SE . It is well known that exogenous application of hormones, such as synthetic auxin (2,4-D) and cytokinin, are required to induce SE [21–23] and furthermore, a functional interaction between auxin and AtLEC2 has been observed. In Arabidopsis, the expression of AtLEC2 was significantly up-regulated in response to exogenously applied 2,4-D during the induction phase of SE . Also, expression levels of AtLEC2 were observed to be significantly higher in embryogenic callus compared to the non-embryogenic callus of the same age . Interestingly, overexpression of AtLEC2 in immature zygotic embryo transgenic explants was able to induce direct somatic embryogenesis, with little callus formation and in the absence of exogenous auxin . Regarding this, Stone and Wojcikowska proposed that AtLEC2 may activate genes involved in auxin biosynthesis, such as YUC1, YUC2, YUC4 and YUC10 [24, 25]. Taken together, AtLEC2 is essential for maintaining embryogenic competency of plant somatic cells through complex interactions with transcriptional regulators and auxin . The LEC genes are also involved in regulation of fatty acid biosynthesis and storage lipid deposition during embryo development. The seed specific overexpression of ZmLEC1 and BnLEC1 led to 35% and 20% increase in seed oil contents in maize and canola, respectively [27, 28]. Ectopic expression of AtLEC2 in Arabidopsis leaves resulted in the accumulation of seed specific fatty acids (C20:0 and C20:1) and increased the mRNA level of oleosin . Furthermore, a direct downstream target of AtLEC2, AtWRI1 is known to control fatty acid metabolism through interactions with key genes upstream in the pathway . Although the functions of AtLEC2 have been extensively studied in Arabidopsis, and homologs described in several plant species , a functional ortholog has not been characterized in any other plants to date. We present here the identification of a putative ortholog of AtLEC2 in cacao, TcLEC2. We characterized the expression patterns of TcLEC2 during both zygotic and somatic embryogenesis and explored the relationships between the activity of TcLEC2 in modulating the embryogenic potential of callus and in regulation of the fatty acid biosynthesis pathway. The Arabidopsis AtLEC2 gene (At1G28300) is part of a large family of B3 domain containing proteins involved in a wide variety of functions. In the Arabidopsis genome, 87 genes were previously annotated as B3 domain containing genes that were further classified into five different families: auxin response factor (ARF), abscisic acid-insensitive3 (ABI3) of which AtLEC2 is a member, high level expression of sugar inducible (HSI), related to ABI3/VP1 (RAV) and reproductive meristem (REM) . In order to identify a putative ortholog of AtLEC2 in cacao, the full-length amino acid sequence of Arabidopsis AtLEC2 was blasted against the predicted proteome of the Belizean Criollo genotype (B97-61/B2) (http://cocoagendb.cirad.fr/ ) using blastp algorithm with E-value cut-off of 1e-5 , which resulted in identification of 13 possible candidate genes (Additional file 1). As a second approach to identify cacao LEC2 gene (s), the predicted protein sequences of each of the 13 candidate genes were used to search the predicted proteome from a second sequenced cacao genome of cv. Matina 1–6 v1.1 (http://www.cacaogenomedb.org ) by Blastp and a set of nearly identical cognate genes were identified for each (Additional file 1). No additional related genes were identified in this variety of cacao. Of the 13 candidate genes, the gene Tc06g015590 resulted in the best alignment with AtLEC2, resulting in a blastp expect value of 3E-75. To identify the most likely AtLEC2-orthologous gene, a phylogenetic analysis was performed with the 13 candidate cacao genes and several representative genes from each of the five B3 domain families in Arabidopsis (Figure 1A). The 13 cacao genes clustered with three of the B3 domain containing gene families (HIS, ABI3, RAV). Three cacao genes clustered within the ABI3 subfamily, with one cacao gene pairing with each of the three Arabidopsis members of this group (Tc04g004970 with AtFUS3, Tc01g024700 with AtABI3 and Tc06g015590 with AtLEC2), again suggesting that Tc06g015590 is the most likely ortholog of AtLEC2 in the cacao genome. This gene exists as a single copy and we tentatively designated it as TcLEC2. Phylogenetic analysis and gene structure of B3 domain containing genes in cacao. A. Unrooted neighbor-joining consensus tree of full-length amino acid sequences of selected Arabidopsis and Theobroma cacao B3 domain containing genes. The scale bar represents 0.2 estimated substitutions per residue and values next to nodes indicate bootstrap values from 1000 replicates. Five families of B3 domain containing genes were identified. The gene most closely related to AtLEC2 (underlined) was designated as TcLEC2. B. Comparison of TcLEC2 and AtLEC2 gene structures. Boxes represent exons and lines indicate introns. Location of the conserved B3 domain is indicated. C. Amino acid alignment of B3 domains from TcLEC2, AtLEC2, AtFUS3, and AtABI3. Residues in black boxes are identical in all four proteins; residues in dark grey boxes are identical in three of four proteins; residues in light grey boxes are identical in two of four proteins. The annotation of TcLEC2 (Tc06g015590) in the cacao genome database predicted two translational start sites 72 bp apart. PCR primers were designed based on the most 5′ potential translation start site and a predicted full-length coding sequence of TcLEC2 was amplified from cDNA extracted from SCA6 mature zygotic cotyledons. A 1368 bp fragment was sequenced and after alignment with the TcLEC2 genomic sequence, a gene model was constructed, consisting of six exons and five introns, nearly identical to the AtLEC2 gene structure (Figure 1B). The lengths of the first and last exons differ slightly and the remaining four are identical. The TcLEC2 encodes an open reading frame of 455 amino acid residues with the B3 domain predicted in the central region of the polypeptide. The full-length TcLEC2 protein shares 42% identity with AtLEC2 (Additional file 2); however, they are 81% identical within the B3 domain (Figure 1C). To investigate the function of TcLEC2 in cacao, its expression was measured by qRT-PCR in various tissues including: leaves at developmental stages A, C, and E (defined in ), unopened flowers, open flowers, roots, endosperm and zygotic seeds at 14, 16, 18, 20 weeks after pollination (WAP). A cacao beta-tubulin gene (TcTUB1, Tc06g000360) that was previously shown to exhibit stable expression levels during cacao seed development (unpublished data) was used for normalization. TcLEC2 was exclusively expressed in cacao endosperm and cotyledon (Figure 2), and significant levels of transcript were not detected in other tissues, consistent with the AtLEC2 expression pattern in Arabidopsis [10, 30]. Moreover, the expression of TcLEC2 was significantly higher in cacao cotyledons at 14 and 18 WAP compared to 16 and 20 WAP, stages previously defined as the onsets of cacao embryo morphogenesis and the seed maturation phase, respectively . A similar biphasic expression pattern was reported for LEC2 in Arabidopsis , suggesting a potential role of TcLEC2 in early developmental induction and in maturation phases of zygotic embryogenesis. Notably, the transcript of TcLEC2 was accumulated to high levels in endosperm (90 days after pollination) when the embryo had just begun development (Figure 2). The endosperm functions to provide nutritive support to the developing embryo, and for crosstalk between maternal tissue and the embryo, being a critical determinant of successful embryo development . Therefore, the abundance of TcLEC2 transcript in the endosperm of developing cacao ovules suggests that TcLEC2 expression in endosperm could be involved in controlling embryo initiation in cacao. TcLEC2 expression pattern in different cacao tissues. Tissues include: leaves and flowers at different developmental stages, roots and zygotic cotyledons from seeds collected at 14, 16, 18 and 20 weeks after pollination (14 W Cot, 16 W Cot, 18 W Cot and to 20 W Cot respectively). The expression levels were analyzed by qRT-PCR and TcLEC2 gene normalized relative to that of TcTUB1 gene. Bars represent mean values (n = 3; mean ± SE). Significance was established by t-test (**represents p-value < 0.01by t-test; *represents p-value < 0.05 by t-test). To test the function of cacao TcLEC2 in regulation of gene expression and to identify its putative downstream targets, a rapid transient transformation assay using cacao leaf tissue was utilized  (see Methods, Additional file 3). TcLEC2 was ectopically overexpressed under the E12-Ω modified CaMV35S promoter (E12Ω::TcLEC2, pGZ12.0108, GenBank Accession: KF963132, Additional file 4) in fully expanded young stage C cacao leaves using Agrobacterium vacuum infiltration. Agrobacterium containing empty based vector pGH00.0126 (control vector, GenBank Accession: KF018690, EGFP only) was also infiltrated in parallel as a control. As expected, TcLEC2 was highly expressed only in leaves transformed with E12Ω::TcLEC2 vector but was not detectable in control leaves (Figure 3). To identify the potential targets of TcLEC2, a set of cacao putative orthologs of genes involved in seed development in Arabidopsis was also assayed via qRT-PCR (Table 1). The predicted ortholog of AGAMOUS-Like 15, a MADS box type transcription factor involved in the induction of somatic embryogenesis from shoot apical meristems , was highly induced (>129 fold) by TcLEC2 ectopic overexpression (Figure 3), which was consistent with the observation that LEC2 and AGL15 were able to activate each other in Arabidopsis . The predicted ortholog of ABA INSENSITIVE 3 (ABI3), which encodes a B3 domain transcription factor active during seed development and previously identified as a downstream target of AtLEC2 in Arabidopsis [41, 42], was also induced (>9 fold) by TcLEC2 (Figure 3). However, another B3 domain transcription factor FUSCA 3 (FUS3) [43, 44] was not responsive to TcLEC2 overexpression in leaf tissues under our experimental conditions (Table 1). The predicted ortholog of WRINKLED 1 (WRI1), an AP2/EREB family transcription factor that is the direct downstream target of AtLEC2 and specifies AtLEC2 function toward fatty acid biosynthesis pathway in Arabidopsis [17, 29], was induced more than ten-fold by TcLEC2 (Figure 3). Moreover, two genes encoding for OLEOSIN proteins, involved in the structure of oil bodies, were also activated in cacao leaves by TcLEC2 ectopic overexpression (Figure 3). Collectively, these results indicated that TcLEC2 was sufficient to induce the ectopic transcription of several important seed specific genes in cacao leaves, supporting its function as a key regulator of embryo and seed development. Genes induced by ectopic overexpression of TcLEC2 in attached cacao leaf transient assay. 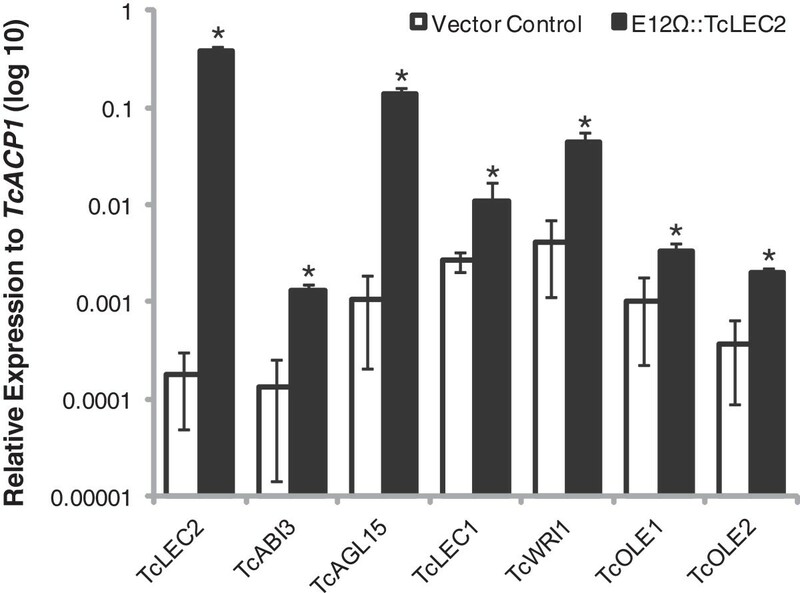 Expression levels of TcLEC2 and TcLEC2 induced genes (TcAGL15, TcABI3, TcWRI1, TcOLE1, and TcOLE2) in TcLEC2 ectopic expressing attached cacao leaves compared to vector control by qRT-PCR. The expression levels of genes were normalized relative to that of TcACP1. (n = 3, mean ± SE) *represents for p-value < 0.05 by t-test. Expression levels were normalized to TcACP1 (column 3 and 4). Fold changes were calculated as a ratio of expression levels induced by TcLEC2 relative to expression levels in tissues transformed with the vector control lacking TcLEC2 and are the mean of three biological replicates (n = 3, mean ± SE). Significance was established by t-test with p-value cut-off of 0.05. Based on the above results, we reasoned that TcLEC2 might also be a key regulator of somatic embryogenesis. To explore this, TcLEC2 was measured in tissues grown with or without the SE inducing hormone 2,4-D (Figure 4). Staminodes from the highly embryogenic cacao genotype PSU-SCA6 were used to produce primary somatic embryos (Figure 4A, panel i) following our previously published protocol . Cotyledon explants (Figure 4A, panel i, red box) were excised and placed on secondary embryogenesis induction media with (SCG) or without (SCG-2,4D) auxin 2,4-D (required for SE induction). After two weeks on these media, the tissues were transferred biweekly to hormone free embryo development media (ED). The explants cultured on SCG media started to produce calli two-weeks after culture initiation (ACI) (panel ii) and secondary somatic embryos were visible after four additional weeks (panel iv and vi). However, on SCG-2,4D, explants expanded and gradually turned green during the first six weeks, then stopped developing and turned brown. Neither calli nor embryos were produced from the explants on SCG-2,4D medium (panel iii, v and vii). TcLEC2 expression correlates with embryogenic potential. A. Illustration of the cacao secondary somatic embryogenesis stages and time frame, indicating the points used for sample collections. 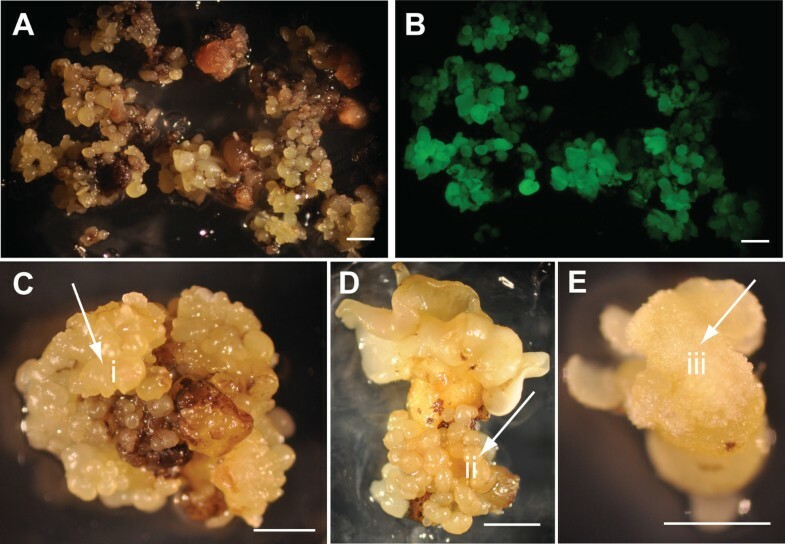 Representative images of several key stages of embryo development: (i) cotyledon stage PSU-SCA6 embryo used as explants to initiate secondary somatic embryogenesis cultures; (i) & (iii) cotyledon explants on hormone-free medium at 28 days ACI, from cultures initiated on SCG medium containing 2, 4D and modified SCG without 2, 4D, respectively; (iv) & (v) cotyledon explants on ED at 46 days ACI (same treatments as above); (vi) & (vii) cotyledon explants on ED at 70 days ACI (same treatments as above); (Bars = 2 mm). B. Time course expression pattern of TcLEC2 during cacao secondary somatic embryogenesis from cultures initiated on SCG medium containing 2,4D and modified SCG without 2, 4D. Expression of TcLEC2 was normalized relative to that of TcACP1 (n = 3 or 4, mean ± SE). C. Expression levels of TcLEC2 at different time points in embryogenic and non-embryogenic calli. Expression of TcLEC2 was normalized relative to that of TcACP1. Bars represent mean ± SE (n = 3 or 4). Significance was established by t-test (*represents for p-value < 0.05). TcLEC2 expression levels were measured in tissues cultured on both SCG and SCG-2,4D media throughout the culture period (Figure 4B). TcLEC2 expression was detectable in primary somatic embryo cotyledons at time 0, then decreased significantly one day after explants were placed on either SCG or SCG-2,4D media (Figure 4B). TcLEC2 expression remained low in both treatments for the following two weeks, indicating that TcLEC2 was not rapidly responsive to exogenous auxin treatment during the induction period. However, between day 32 and 36 ACI, TcLEC2 expression levels were slightly increased and variable in both treatments. Notably, at 46 days ACI the development of embryos was first observed on SCG media arising from calli (embryogenic calli). RNA was extracted from the embryogenic calli (without visible embryos) and a large increase in TcLEC2 gene expression was observed by qRT-PCR. On SCG-2,4D media, embryos were not observed and TcLEC2 expression was not detectable. A common occurrence in tissue culture is dedifferentiation of different types of calli that vary in their totipotency to regenerate somatic embryos [45, 46]. With cacao tissue cultures, we and our collaborators have frequently observed two types of calli, those that produce abundant embryos (embryogenic calli) and those that produce few if any embryos (non-embryogenic calli) (unpublished observations). To investigate the relationship between TcLEC2 activity and embryogenic potential of the calli, TcLEC2 gene expression was compared in embryogenic and non-embryogenic calli growing from explants cultured on SCG media. The observed average levels of TcLEC2 expression were 20-fold higher in the embryogenic calli compared to the non-embryogenic calli of the same age (Figure 4C), suggesting a tight association between TcLEC2 expression and embryogenic competency. Given the role of AtLEC2 in controlling embryo development in Arabidopsis, we hypothesized that TcLEC2 may play a similar role in the control of cacao somatic embryo development. The current methods for Agrobacterium-mediated transformation of cacao genotype results in reproducible but very low rates of transgenic embryo recovery . We speculate that this is a result of very low co-incidence of stable T-DNA integration into the cacao genome and the same cells entering the embryogenic pathway. We hypothesized that overexpression of TcLEC2 might enhance the rate of somatic embryogenesis and thus improve the recovery of transgenic SEs through increased co-incidence with T-DNA integration events. To test this, we performed Agrobacterium-mediated transformation experiments on cotyledon explants excised from primary embryos for co-cultivation with Agrobacterium containing the control vector (pGH00.0126) or the E12Ω::TcLEC2 vector (pGZ12.0108). Two weeks after co-cultivation, the initial transient expression levels of GFP in tissues transformed with the control vector were always higher than E12Ω::TcLEC2 (Additional file 5). This may be due to the larger size of the E12Ω::TcLEC2 containing plasmid relative to the control vector, the inclusion of a repeated promoter element, or the addition of a third highly expressed transgene. We have observed this phenomenon with other unrelated plasmids containing transgenes (unpublished data). During the subsequent weeks of culture on embryogenesis media, large numbers of non-transgenic embryos (GFP negative) were observed in all three independent transformation trials regardless of the presence of the TcLEC2 transgene (Additional file 6). There was no consistently significant difference observed between the transformations of control vector and E12Ω::TcLEC2 in terms of the cumulative non-transgenic embryo production (Additional file 6). To identify stably transformed embryos, GFP fluorescence was observed by stereomicroscopy as a visualization marker. With the control vector lacked the TcLEC2 transgene, no GFP expressing embryos were observed on over 176 cotyledon explants cultured in three separate experiments. Surprisingly, the transformation with E12Ω::TcLEC2, containing theTcLEC2 transgene, resulted in the recovery of over 300 stable transgenic embryos distributed over the entire surface of the cotyledon explant (Figure 5A-B). This result was dramatically higher than the stable transformation results we have observed over many years, with several different transgenes, where the prior record for a single transformation (about 200 cotyledon explants) was 8 GFP positive embryos [47–49]. Thus, although TcLEC2 did not impact the initial levels of transient transformation (Additional file 5) or embryogenesis frequency of non-transgenic embryos (Additional file 6), it greatly increased the frequency of transgenic embryo production, which confirmed our hypothesis. Effect of stable overexpression of TcLEC2 in cacao secondary somatic embryos. A &B. Secondary embryogenic explants transformed with Agrobacterium, regenerating stable transgenic E12Ω::TcLEC2 embryos were photographed under white and with GFP imaging optics, respectively. C, D &E. Transgenic somatic embryos expressing E12Ω::TcLEC2. (i) embryo-like structure formed on top of cotyledon (ii) embryo-like structure formed along embryo axis (iii) callus-like structure formed on top of cotyledon. Although a large number of transgenic TcLEC2 embryos were obtained, most of them exhibited prominent developmental and morphological abnormalities (Figure 5C, D, and E), and most ceased development at the globular or heart stage and the initiations of cotyledons were significantly compromised. The few embryos that did develop to cotyledon stage formed callus on top of the cotyledons (Figure 5E) and new embryos were occasionally initiated along the embryo axis (Figure 5C and D). The attempts to recover plants from any of these embryos were unsuccessful. To test the effect of stable overexpression of TcLEC2 transgene on iterative somatic embryogenesis, cotyledons from fully developed mature transgenic E12Ω::TcLEC2 embryos were excised and cultured for tertiary embryo production as previously described . Cotyledon explants from non-transformed PSU-SCA6 SEs were cultured as controls. Remarkably, cotyledon explants from transgenic E12Ω::TcLEC2 lines started to produce tertiary embryos as early as four weeks ACI (Figure 6B), compared to six weeks for PSU-SCA6 lines (Figure 6A). Additionally, while the majority of tertiary embryo production from PSU-SCA6 lines was completed by 14 weeks ACI, after which very few SEs were produced (Figure 6C), explants from transgenic E12Ω::TcLEC2 lines continued to produce large numbers of embryos until twenty weeks ACI, when the experiment was terminated (Figure 6D). In total, within the twenty week period, transgenic E12Ω::TcLEC2 lines produced about 2.5 times more tertiary embryos per explant (p-value < 0.001) compared to PSU-SCA6 lines (Figure 6E). Overexpression of TcLEC2 increases tertiary somatic embryogenesis efficiency. A. Tertiary PSU-SCA6 culture on hormone free medium at 4 weeks ACI. B. Tertiary stable transgenic E12Ω::TcLEC2 culture on hormone free medium at 4 weeks ACI. C. Tertiary PSU-SCA6 culture on hormone free medium 20 weeks after culture initiation. D. Tertiary stable transgenic E12Ω::TcLEC2 culture on hormone free medium at 20 weeks ACI. E. Average number of tertiary embryos produced per explant from PSU-SCA6 and stable transgenic E12Ω::TcLEC2 explants (n = 4, mean ± SE) (Bars = 2 mm). In addition to its role in initiation of embryogenesis, it has been well documented in Arabidopsis that AtLEC2 also regulates de novo fatty acid biosynthesis during embryo development. Evidence includes, but is not limited to, (a) transgenic 35S::AtLEC2 ovules exhibited a mature seed-like fatty acid profile ; (b) ectopic overexpression of AtLEC2 in leaves resulted in accumulation of seed specific lipids and very long chain fatty acids ; (c) AtLEC2 directly regulates expression of AtWRI1, which is known to play a role in regulation of fatty acid metabolism in developing embryos . Since fatty acids, in the form of triacylglycerols (TAGs), are major storage components of mature cacao seeds, we examined the role of TcLEC2 in control of fatty acid biosynthesis in cacao immature zygotic embryos (IZEs). E12Ω::TcLEC2 was transiently overexpressed in IZEs (12 weeks old) in parallel with the control vector (pGZ00.0126). High transient expression was confirmed by fluorescence microscopy to detect EGFP on approximately 90% of explants surfaces (Additional file 7). Overexpression levels of TcLEC2 in transformed IZEs were further confirmed by qRT-PCR and compared to the basal levels of TcLEC2 in control vector transformed IZEs (Figure 7). Consistent with the observations in attached leaf transient assay (Figure 3), the overexpression of TcLEC2 resulted in elevated transcript of TcAGL15 and TcLEC1 in the IZE tissues (Figure 7A). Unlike in transiently transformed leaf tissue, induced expression of TcWRI1 was not detected in the transformed IZEs under our qRT-PCR condition (40 cycles) (Additional file 8). Transient overexpression of E12Ω::TcLEC2 in IZE altered fatty acid compositions and gene expression. A. Changes of the expression levels of responsive enzymes on the fatty acid biosynthesis pathway; expression levels of genes were normalized relative to that of TcTUB1; (n = 3, mean ± SE) *represents for p-value < 0.05 by t-test. B. Molar percentages of fatty acid compositions in cacao immature zygotic embryos transiently overexpressing vector control and E12Ω::TcLEC2, respectively; (n = 3, mean ± SE). **represents for p-value < 0.001 by t-test. C. Diagram of proposed model to explain the relationship between gene expression levels and altered fatty acid compositions. Enzymes are marked in circle. Enzymes that were regulated by the activity of TcLEC2 are in black, otherwise, in grey. Abbreviation: ER, endoplasmic reticulum; ACP, acyl carrier protein; CoA, Coenzyme A; FAB2, fatty acid desaturase; Fat, fatty acyl-ACP thioesterase; KAS, 3-ketoacyl-ACP synthase; FAD2, oleoyl desaturase; FAD3, linoleoyl desaturase; FAD6, oleoyl desaturase on membrane glycerolipid; FAD7/8, linoleoyl desaturase on membrane glycerolipids; PC, phosphatidylcholine; G3P, glycerol-3-phosphate; LPA, lysophosphatidate; PA, phosphatidate; DAG, diacylglycerol; TAG, triacylglycerol; PDAT, phospholipid:diacylglycerol acyltransferase; DGAT, 1,2-sn-diacylglcyerol transferase. To obtain further insights into TcLEC2 regulatory functions during embryo development, we identified the most likely orthologs of genes for key enzymes controlling the fatty acid biosynthesis and production of TAGs in the cocoa genome by homology to Arabidopsis gene sequences (Figure 7C and Additional file 9) and compared their expression levels in IZEs tissues overexpressing E12Ω::TcLEC2 and control vector (Figure 7A). mRNA levels of TcKASII (Tc09g006480), a condensing enzyme β-ketoacyl-[acyl-carrier-protein] synthase II responsible for the elongation of C16 to C18 , was two-fold lower (p-value < 0.05) in the TcLEC2 transformed tissue compared to the controls (Figure 7A). In addition, the predicted ortholog of TcFatA (Tc01g022130) and two isoforms of TcFatB (Tc01g022130 and Tc03g015170), two types of acyl-[acyl-carrier-protein] thioesterases that specifically export C18:1 (FatA) and other saturated fatty acid moieties (FatB) from plastid into cytosol , were significantly up-regulated by more than 1.5 fold (p-value < 0.05). Interestingly, the predicted diacylglycerol acyltransferase 2 (TcDGAT2, Tc01g000140), a key enzyme that catalyzed the last step of TAG assembly through an acyl-CoA dependent pathway , was significantly up-regulated by 1.5 fold (p-value < 0.05). No significant differences in the expression levels of two isoforms of fatty acid desaturase 2 (FAB2, Tc04g017510 and Tc08g012550) were observed (Additional file 8). To determine if these changes in gene expression resulted in altered metabolite profiles, fatty acid composition was measured by gas chromatograph/mass spectrometry (GC/MS) in IZEs tissues transformed with both E12Ω::TcLEC2 and control vector. Overexpression of TcLEC2 resulted in a significant increase of the level of cis-vaccenic acid C18:1n-7 (p-value < 0.001), an isoform of oleic acid (OA), and significantly decreased the level (p-value < 0.001) of linoleic acid (LA, C18:2n-6) compared to tissues transformed with vector control (Figure 7B). Somatic embryogenesis has long been considered a superior propagation system for many crops [53–55] because of its inherent high multiplication rate and potential for year round, uniform disease free plant production. Although theoretically, every somatic plant cell has the capacity to dedifferentiate and redifferentiate into a whole plant (totipotency), the competencies of plant cells to enter the somatic embryogenesis developmental pathway varies dramatically between different tissues, developmental stages, and species. Accumulated evidence has revealed that the activity of AtLEC2 is highly associated with embryogenic competency and involves interactions with several other regulatory factors. Our results are consistent with a role of cacao TcLEC2 in the regulation of somatic embryogenesis similar to AtLEC2 in Arabidopsis. Supporting evidence includes; (1) ectopic overexpression of TcLEC2 in cacao stage C leaves was able to induce the expression of seed transcription factor genes, such as TcAGL15, TcABI3 and TcLEC1; (2) the induced expression level of TcLEC2 was associated with embryogenic capacity in explants; (3) constitutive overexpression of TcLEC2 in secondary somatic embryo tissue leads to earlier and increased regeneration of tertiary embryos compared to PSU-SCA6 controls. Collectively, our evidence supports the conclusion that TcLEC2 is a functional ortholog of AtLEC2 and that it is involved in similar genetic regulatory networks during cacao somatic embryogenesis. Transient overexpression of TcLEC2 in cotyledon explants by itself was not sufficient to increase embryogenesis efficiency of non-transgenic somatic embryos (Additional file 6). This suggests that there are other factor (s) that are required for cell dedifferentiation and redifferentiation, which are not present during the period of time examined in our embryogenesis culture system. However, the constitutive overexpression of TcLEC2 in stably transformed cells resulted in greatly enhanced somatic embryogenesis as early as four weeks compared to six to seven without TcLEC2 overexpression (Figures 5B, 6B and E), implying that the enhanced activity of TcLEC2 is sufficient to promote the efficiency of somatic embryogenesis in cacao. The very high degree of genotype variation in embryogenic capacity for SE in cacao limits its’ practical application for large scale propagation . Therefore, TcLEC2 could be a useful molecular marker for screening cacao genotypes for high embryogenic capacities. Additionally, the levels of TcLEC2 expression in callus and other tissues in vitro could be used for evaluating the effect of different media and other variables for further optimization of the SE protocols. Potentially, we could explore the possibility to promote somatic embryogenesis in cacao leaves or other tissues by ectopically expressing TcLEC2. Fatty acid composition and lipid profiles of cacao seeds are important quality traits for chocolate industry. Therefore, there is great interest in identification of the genetic networks regulating its biosynthesis. LEC2, and its partners LEC1, ABI3 and FUS3 are known to be critical regulators of fatty acid and lipid biosynthesis in Arabidopsis and other species, and thus impact many aspects of seed development. Moreover, of particular relevance to applications of this knowledge, the level of WRI1, a downstream target of LEC1, LEC2 and FUS3, was highly correlated with seed oil content in different B. napus genotypes . Our observations that TcLEC2 overexpression resulted in increased expression of TcLEC1 and TcWRI1 (Figure 3) in attached cacao leaves promoted us to speculated that this might result in changes in fatty acid composition and TAG assembly. Indeed, transient overexpression of TcLEC2 in zygotic embryos resulted in increased C18:1n-7 and decreased C18:2n-6 levels (Figure 7B), similar to changes occurring during cacao seed maturation when profiles change from mainly polyunsaturated fatty acids (C18:2n-6 and C18:3n-3) to almost exclusively saturated (C16:0 and C18:0) and monounsaturated fatty acid (C18:1n-9) . However, given the fact that the expression of TcWRI1 was not induced by overexpression of TcLEC2 in immature zygotic embryos, it suggests that WRI1 is not required to mediated impacts of TcLEC2 on fatty acid biosynthesis, and that the regulatory network between TcLEC2 and other transcription factors on fatty acid biosynthesis is not the same in cacao as they are in Arabidopsis and B. napus. The overexpression of TcLEC2 also resulted in changes in gene expression for some of the major structural genes for fatty acid biosynthesis, and this could provide an explanation for the fatty acid composition shifts we observed. C18:1n-7 is synthesized from C16:0 via the production of C16:1n-9 by FAB2 and further elongation to C18:1n-7 . 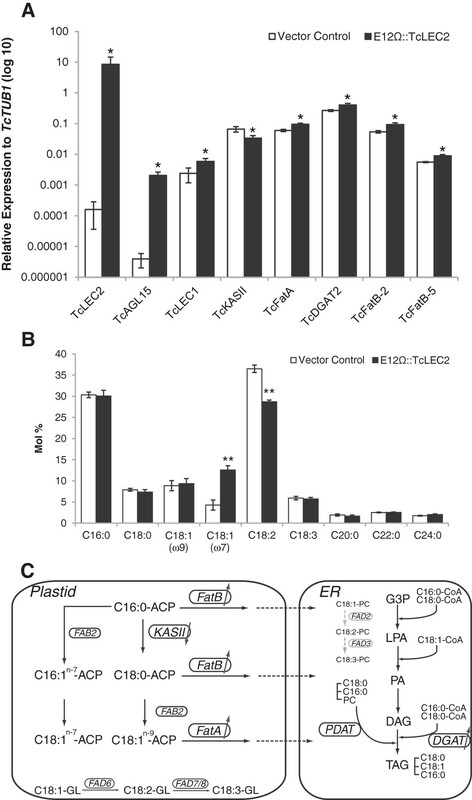 The decreased expression level of TcKASII may increase the substrate availability of C16:0, which could serve as a substrate for TcFAB2 for the production of C16:1n-9 and further leading to C18:1n-7 accumulation (Figure 7C). The increased levels of TcFatA and two isoforms of TcFatB (all significantly up-regulated by more than 1.5 fold) could contribute to increased production and accumulation of saturated fatty acid (C16:0 and C18:0) and monounsaturated fatty acid (C18:1n-9) during cacao seed maturation (Figure 7C). Interestingly, the expression of TcDGAT2 was also significantly increased by overexpression of TcLEC2, but the expression level of TcDGAT1.1 was not affected (Additional file 8). The activities of DGAT genes were highly correlated with the oil content and compositions in oilseeds  and three known types of DGAT genes (DGAT1, DGAT2 and DGAT3) are different in terms of substrate specificities and subcellular localizations . According to an unpublished study, the expression of TcDGAT2 in yeast has led to accumulation of more C18:0 in TAG fraction compared to the expression of TcDGAT1 . Considering the fact that the majority of TAGs in cacao mature seeds consist of unsaturated fatty acid (C18:1) exclusively on sn-2 and saturated fatty acids (C16:0 and C18:0) on sn-1 and 3 (Figure 7C), it is plausible to speculate, that the activity of TcDGAT2 is more significant to catalyze the final acylation on sn-3 of TAG assembly compared to TcDGAT1. This argument was further supported by our result indicating that the expression level of TcDGAT2 was approximately five times higher than TcDGAT1 in cacao immature seeds (Figure 7A and Additional file 8). Collectively, our data indicates that TcLEC2 could be involved in regulation of lipid biosynthesis during cacao seed maturation through control of TcDGAT2 gene expression. However, whether TcLEC2 is able to directly trans-activate TcDGAT2 or its action is mediated through other transcription factors, remains unknown. Further research on the regulatory mechanism controlling fatty acid biosynthesis and TAG assembly in cacao will contribute to identification of the key enzymes in the pathway and aid the screening process for elite cacao varieties to meet industrial demands. The isolation and functional characterization of LEC2 ortholog from cacao genome reveal crucial roles of TcLEC2 in regulating both zygotic and somatic embryogenesis. 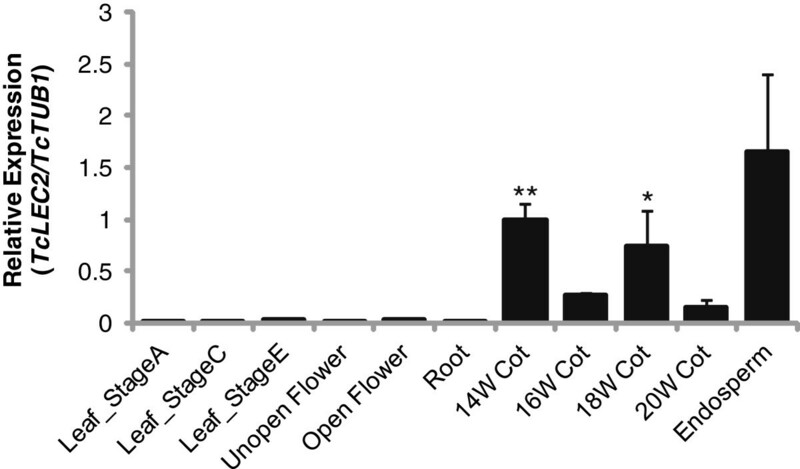 The exclusive expression pattern in seed and the identification of its regulatory targets, such as AGL15 and WRI1, strongly indicate the functional similarities between AtLEC2 and TcLEC2. However, the impacts of TcLEC2 on fatty acid biosynthesis in cacao also suggest that TcLEC2 is able to direct or indirectly interact with many key enzymes on the pathway, which has not been well characterized yet in Arabidopsis. Furthermore, the correlation between the activity of TcLEC2 and embryogenic potential during cacao somatic embryogenesis provides us a great opportunity to better understand and improve our current inefficient and variable propagation system of cacao. B3 domain containing genes in Theobroma cacao were identified by blastp using AtLEC2 (At1g28300) as queries (E-value cut off 1e-5). Multiple protein sequence alignment was performed by MUSCLE . The phylogenetic tree was constructed by MEGA4.1 using neighbor-joining algorithm with Poisson correction model and the option of pairwise deletion . Bootstrap values represent 1000 replicates. Full-length Arabidopsis AtLEC2, AtABI3, and AtFUS3, protein sequences were used to search the Cocoa Genome Database (http://cocoagendb.cirad.fr/) by tblastn  to obtain the full-length TcLEC2, TcABI3 and TcFUS3 nucleotide sequences, respectively. The functional B3 domains were predicted using InterPro program (http://www.ebi.ac.uk/interpro/) on EMBL-EBI website. B3 domain containing proteins from five subfamilies in Arabidopsis were identified and selected according to . Plant tissues collected from SCA6 genotype of cacao were first ground in liquid nitrogen. Total RNA was extracted using Plant RNA Purification Reagent (Life Technologies, Cat. 12322–012, following manufactures protocol). The concentration of RNA was measured using a Nanodrop 2000c (Thermo Scientific). RNA was further treated with RQ1 RNase-free DNase (Promega, Cat. M6101) to remove potential genomic DNA contamination (following the manufacturer’s protocol). 250 ng of treated RNA was reverse-transcribed by M-MuLV Reverse Transcriptase (New England Biolabs) with oligo-(dT)15 primers. The full length TcLEC2 was amplified from SCA6 mature seed cotyledon cDNA with the primer pair (TcLEC2-5′-SpeI: GCACTAGTATGGAAAACTCTTACACACC and TcLEC2-3′-HpaI: GCGTTAACTCAAAGTGAAAAATTGTAGTGATTGAC) and cloned into pGH00.0126  driven by the E12-Ω promoter resulting in plasmid pGZ12.0108 (Additional file 7). 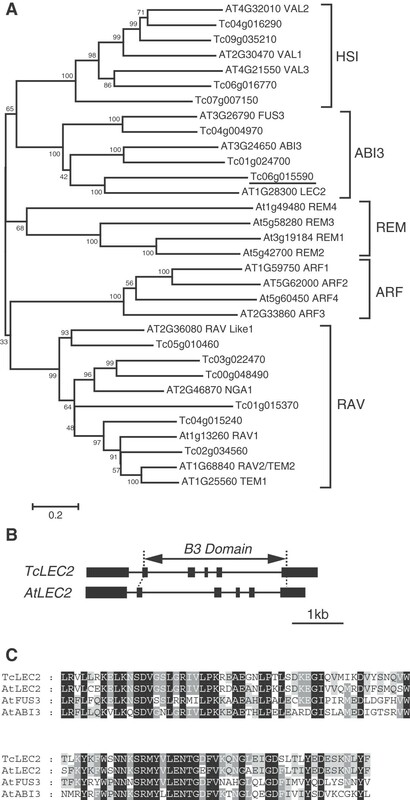 The recombinant binary plasmid was introduced into A. tumefaciens strain AGL1  by electroporation. RNA samples were extracted and reverse-transcribed into cDNA as described above. The primers to detect TcLEC2 transcripts were designed based on the coding sequence of TcLEC2 (Tc06g015590 ) (TcLEC2-Realtime-5′: TGACCAGCTCTGGTGCTGACAATA; TcLEC2-Realtime-3′: TGATGTTGGGTCCCTTGGGAGAAT). qRT-PCR was performed in a 10 μl mixture containing 4 μl diluted-cDNA (1:50), 5 μl SYBR Green PCR Master Mix (Takara), 0.2 μl Rox, and 0.4 μl each 5 μM primers. Each reaction was performed in duplicates in Roche Applied Biosystem StepOne Plus Realtime PCR System under the following program: 15 min at 94°C, 40 cycle of 15 s at 94°C, 20s at 60°C, and 40 s at 72°C. The specificity of the primer pair was examined by PCR visualized on a 2% agarose Gel and dissociation curve. An acyl carrier protein (Tc01g039970, TcACP1  TcACP1-5′: GGAAAGCAAGGGTGTCTCGTTGAA and TcACP1-3′: GCGAGTTGAAATCTGCTGTTGTTTGG), and a tubulin gene in cacao (Tc06g000360, TcTUB1  TcTUB1-5′: GGAGGAGTCTCTATAAGCTTGCAGTTGG and TcTUB1-3′: ACATAAGCATAGCCAGCTAGAGCCAG) were used as the reference genes. A. tumefaciens strain AGL1 carrying either control vector (pGH00.0126, GenBank Accession: KF018690, EGFP only) or E12Ω::TcLEC2 (pGZ12.0108, GenBank Accession: KF963132, Additional file 4) were inoculated in 100 ml 523 medium with 50 μg/ml kanamycin and grown with shaking (200 rpm, 25°C) overnight to optical density (O.D.) of 1.0 at 420 nm. AGL1 was pelleted at 1500xg for 17 min at room temperature and resuspended in induction media  to to O.D. of 1.0 at 420 nm. AGL1 was induced for 3 h at 100 rpm at 25°C and Silwet added to a final concentration of 0.02%. For the attached leaf transient transformation assay we used fully expanded, young leaves (developmental stage C as defined in ) from genotype SCA6 grown in a greenhouse. The petioles of the leaves were wrapped with parafilm and set in the groove of a modified vacuum desiccator to create a seal and to avoid damage to leaves. The leaves were soaked in AGL1 induction media in the desiccator and were vacuum infiltrated at -22 psi for 2 min using a vacuum pump (GAST Model No. 0523-V4F-G582DX). Vacuum infiltration was performed three times to increase transformation efficiency. The transformed cacao leaves remained on the plant for three days after infiltration then collected and evaluated by fluorescence microscopy. The regions with high GFP expression (>80% coverage) were selected and subjected to further analysis. For immature zygotic embryo transient transformation assay, developing fruit (open pollinated Sca6, four months after pollination) from the USDA germplasm collection in Puerto Rico. Zygotic embryo cotyledons were collected and suspended in the ED media  before transformation. Zygotic cotyledons were soaked in AGL1 induction media and transformation was performed as described above for leaf transient expression assays. The transformed tissues were analyzed five days after infiltration. Primary somatic embryogenesis was performed as previously described . Glossy cotyledons from healthy and mature primary embryos were cut into 4 mm X 4 mm square pieces, and infected using A. tumefaciens strain AGL1 carrying the T-DNA binary vectors as previously described  with minor modifications: (1) the AGL1 was pelleted and resuspended in induction media  to reach the O.D. of 1.0 at 420 nm instead of 0.5; (2) after transformation, the infected cotyledons were co-cultivated with A. tumefaciens strain AGL1 on the filter paper for 72 h at 25°C in the dark instead of 48 h. The transformed explants were cultivated and transgenic secondary somatic embryos were identified by screening for GFP fluorescence as previously described . Fresh plant tissues were ground in liquid nitrogen and fatty acid methyl esters (FAME) were prepared using approximately 30 mg of tissue extracted in 1 ml buffer containing MeOH/fuming HCl/Dichloromethane (10:1:1, v/v) while incubated without shaking at 80°C for 2 h. Fatty acid methyl esters were re-extracted in 1 ml buffer H2O/Hexane/Dichloromethane (5:4:1, v/v) with vortexing for 1 min. The hexane (upper phase) was separated by centrifugation at 1500xg for 5 min, transferred to Agilent glass GC vials and evaporated to dryness under a vacuum. The FAMEs were then dissolved in 500 μl hexane for GC/MS analysis. Pentadecanoic acid (C15:0) (Sigma, Cat. P6125) was used as the internal standard added prior to the extraction and methyl nonadecanoate (C19:0-methyl ester) (Sigma, Cat. N5377) was used as the spike control, added into the sample prior to the GC injection. Fatty acid derivatives were analyzed on an Agilent 6890 Gas Chromatograph equipped with FAME Mix Omegawax 250 Capillary GC column (Sigma, Cat. 24136). A Waters GCT Classic mass spectrometry was directly connected to the GC operation. EI of 70 eV was applied. Peak height areas were used to quantify the abundance of each fatty acid species, and the mass spectra were interpreted by comparing with the NIST/EPA/NIH Mass Spectra Library . Sequence data from this article can be found in either The Arabidopsis Information Resource (TAIR) or CocoaGenDB (http://cocoagendb.cirad.fr/gbrowse/cgi-bin/gbrowse/theobroma/) under the following accession numbers in Table 2. We would like to thank Dr. Phillip Smith from Proteomics and Mass Spectrometry Core Facility for the great help with GC analysis, Lena Landherr and Sharon Pishak for the technical assistance in maintenance of our cacao tissue culture pipeline. We are also grateful to Andrew Fisher for valuable comments to improve the manuscript. We thank Brian Irish of the USDA ARS located in Mayaguez, Puerto Rico, for provision of cacao pods. This work was supported in part by The Pennsylvania State University, College of Agricultural Sciences, The Huck Institutes of Life Sciences, the American Research Institute Penn State Endowed Program in the Molecular Biology of Cacao and a grant from the National Science Foundation BREAD program in cooperation with the Bill and Melinda Gates Foundation (NSF0965353) which supported the development of the transient gene expression assay for cacao. YZ performed most of the experiments, such as phylogenetic analysis, gene expression analysis, transient and stable transformation assays, FAME analysis, and drafted the manuscript. AC participated in the vector construction, gene expression analysis, somatic embryogenesis transformation, and review the manuscript. SNM involved in designing and directing the experiments, and revising the manuscript. MJG conceived the study, gave advice on experiments, drafted and finalized the manuscript. All authors read and approved the final manuscript.